No list of the all-time greatest Scottish half-milers would be complete without the name of Hamish Stothard. The lanky Edinburgh runner was a stylish and gutsy performer with a good tactical brain and a consistent record for rising to the big occasion. During his career he set Scottish records and garnered honours ranging from Scottish, A.A.A., Intervarsity and British U.A.U. titles and a pair of British Empire Games bronze medals to three golds and a silver in the International University Games (known today as the Universiade). The only piece missing from this collection of hardware is, of course, an Olympic medal. In the run-up to the 1936 Olympics he had been discussed as a potential successor to Tom Hampson, gold medallist in the 800 metres at Los Angeles, but that’s another story. Hamish Stothard was not only a great all-round athlete, but also, like his illustrious compatriot and predecessor Eric Liddell, an accomplished rugby player. Versatility was the name of the game with Stothard, for he was also an avid golfer with a handicap to die for! James Charles Stothard was born in Edinburgh on May 6, 1913. 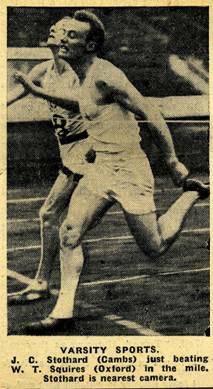 Like Charlie Mein and Hugh Maingay, Scotland’s leading half-milers of the 1920’s, he enjoyed a privileged upbringing. His wealthy father George Stothard was a rubber planter and the director of a major rubber company in Penang, Malaysia. Latex rubber was a lucrative business in early 20th century when the demand for rubber skyrocketed due, among other things, to the rapid growth of the tyre industry. The business instinct evidently ran strong in the Stothard family. Stothard was educated at Merchiston Castle School, the private boarding school for boys which has always been synonymous with academic excellence and sporting tradition. When Stothard entered Merchiston, the school had already nurtured a string of well-known athletes over the years, the most notable of these being Hugh Welsh, the former A.A.A. champion and Scottish mile record holder. 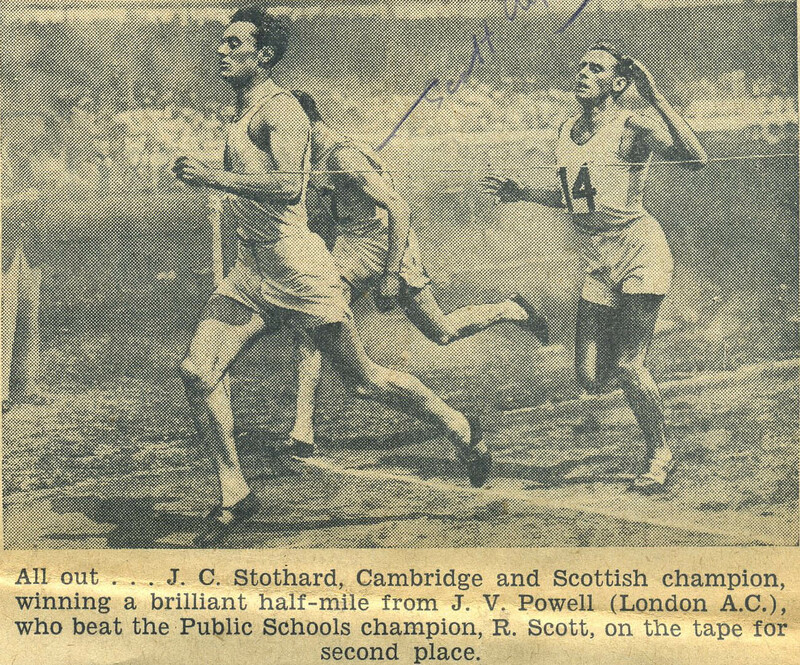 Stothard’s athletic talent first shone through in 1928, when, aged 14, he won no fewer than four events at the annual school sports, the “Merchiston Castle School Games”. Also attending Merchiston Castle School at this time was Stothard’s younger brother George, who likewise was a talented athlete, albeit more the sprinter/jumper type. Between them, the Stothard bros. fairly raked in the school titles during their time at Merchiston. In 1929 Stothard annexed another three events and claimed the Junior Games Cup, smashing the junior record in the cross-country race and improving to 2:09.0 in the half-mile. 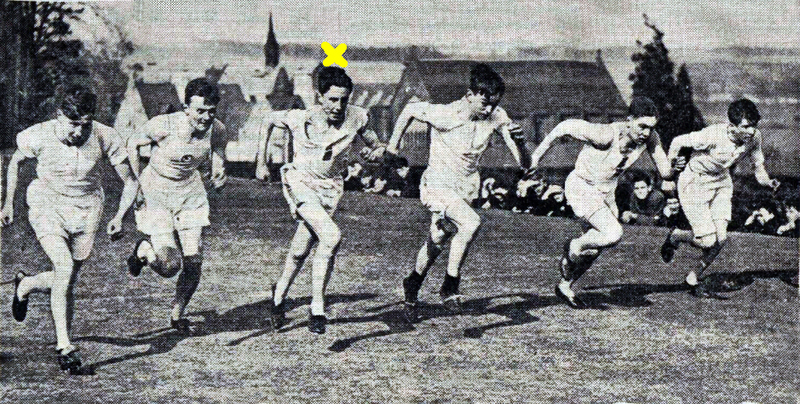 This was some going for a 15-year-old as the quarter-mile grass track at Merchiston was often heavy and slow and the weather was seldom propitious at this time of year. Then, in early 1930, a team of well-known Achilles athletes on a promotional and coaching tour of Scottish public schools visited Merchiston and had a match against the schooboys, who, in the interests of fair competition, received handicaps. After taking fourth in the long jump, where his 5.51 metres clearance and 1 ft. 9 ins. concession were still not enough to match the 6.87 metres returned by the Olympian R.W Revans, Stothard toed the line for the half-mile. The Achilles men ran 4 yards wide as a handicap and the Merchiston boy took full advantage, romping home 20 yards ahead of the Australian W.C. Wentworth in 2:07.6. That year, Stothard added another four school events to his collection and won the Senior Games Cup by some margin. After finishing quarter a mile ahead of the nearest opposition in the senior cross-country race, the Scotsman commented: “The senior race winner J.C. Stothard is a very promising 16-year-old runner, who is expected to do well in the Games Cup this year.” Again, he won four events in total. Moreover, he defied near gale-force winds to set school records of 54.4 for the quarter-mile and 2:04.4 for the half-mile, and then, for good measure, he equalled the mile record with 4:44.6. The previous quarter-mile figures of 55.2 had, it will be noted, jointly been held by G.O. Turnbull and W.H. Welsh and had stood since 1893. Then, for Stothard, it was off to Cambridge University, where he matriculated at Caius College and settled into student life for the next four years. He began to train regularly on the university training ground at Fenner’s, where the cinder oval was a world removed from the grass tracks he had been accustomed to in Edinburgh. Of course, the chance to train with other top-calibre athletes provided an added spur for this budding middle-distance novice. He made rapid strides, and by December was a member of the Light Blues quartette which won the Intervarsity 4 x 880 relay championship at Fenner’s in a record-equalling in 7:58.4. December might sound rather late or early for track racing, depending on your perspective, but in those days the athletics season at British public schools and universities typically ran from the winter until the spring, as cricket was played during the summer term. The 1933 season typically began in February for the Cantabrians, pick of the early season outings being a 53.3 quarter-mile at Fenner’s to blow off the cobwebs. Then, in the Cambridge University sports at the Fenner’s Ground on March 4, Stothard lost by inches to Forbes Horan in the half-mile, but in clocking 1:59.4 he had, of course, finally gained admission to the exclusive sub two minute club. Two weeks later at the Intervarsity meeting he ran a similar time to finish third behind Pen Hallowell (Harvard) and Horan. The first title of any note came his way only two months later, on May 20, when he won the half-mile in the British Universities Athletic Union championships at the White City in 1:58.2. Then, after a 1:58.4 win over the highly rated Tommy Scrimshaw, Belgrave Harriers, in the A.A.A. vs. Cambridge University match at Fenner’s on June 6, Stothard was selected for the combined Oxford and Cambridge team due to compete against their Ivy League rivals in the USA in July of 1933. That year Stothard did not contest the Scottish championships as it clashed with the Varsity tour. In his absence, the half-mile title went the way of A.L. Cram, Edinburgh University AC, who won by three yards from T.J. McAllister, Beith Harriers, in a modest 2:00.8. Arriving in the USA in early July, the combined British team trained at Yale ahead of their match against Harvard and Yale at Cambridge, Mass., on July 8, where Stothard came third in the half-mile. The following week in the match against Princeton and Cornell at Princeton, New Jersey, he finished fourth in the half-mile, won by Princeton’s Bill Bonthon in 1:53.0. The highlight of the meeting was the show-down between Bill Bonthron and the New Zealander Jack Lovelock in the mile, the latter winning by six yards in a world record of 4:07.6. The experience of competing in the USA and seeing at first hand how the créme de la créme of America’s athletes lived and trained had evidently done Stothard the world of good. Being on the same team as the great Jack Lovelock could not have done him any harm either and Stothard would have worked out with the affable Kiwi. And so it was that he emerged the next season as an altogether more formidable athlete as evidence by a 3:09.2 from scratch in a three-quarter mile handicap at the Fenner’s Ground on February 22. This was a week or so before his first major competitive outing of 1934, when he scored an impressive double in Cambridge University sports, winning the half-mile in 1:56.6 and the mile in 4:23.2. Both performances were significant improvements on anything he had achieved before and made him something of an overnight sensation in his native Scotland where the standard in the half-mile in particular had slipped somewhat since 1932. The following week Stothard took yet another giant leap forward in the Varsity Match at the White City where he helped rewrite the history books by pushing Pen Hallowell (USA & Baliol) to a new Varsity record of 1:54.2, eclipsing the 1:54.8 which had stood to Kenahan Cornwallis since 1904. Stothard, runner-up 3 yards behind the American, also bettered the old record with a time of 1:54.6. It was also more than a second inside the Scottish record that had stood to the credit of Bobby Graham since 1932. Clearly, Scotland had a new middle-distance star! A 1:59.8 win over Michael Gutteridge, a 1:54.8 performer, at the Cambridge University vs. A.A.A. match at Cambridge on June 5 set Stothard up nicely for his debut at the Scottish championships at Hampden Park on June 23, where he was competing for the Edinburgh Atalanta Club, the Scottish equivalent of the Achilles Club catering to university students. The race, it could be said, went by the form book, because Stothard was untroubled by the domestic opposition and won by 10 yards from Bobby Graham in 1:58.8. Stothard then, to the surprise of many, elected to forego the A.A.A. championships and chose instead to ready himself for the prestigious International Varsity Match between Oxford and Cambridge and Princeton & Cornell at the White City a week after the A.A.A.’s, where, in his absence, Jack Cooper easily won the half-mile from Jack Powell and Michael Gutteridge in 1:56.4. 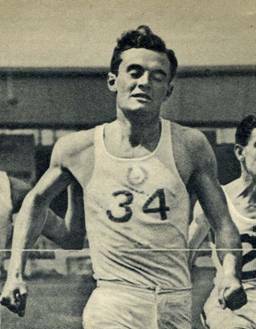 In the Intervarsity half-mile Stothard faced strong opposition including Princeton’s Bill Bonthron, who three weeks earlier had set a 1500 metres world record of 3:48.8 at Milwaukee. However, the Scot was in unbeatable form and sprinted to victory by 2 ½ yards from Bonthron in 1:58.6. Even if the American crack perhaps wasn’t at his best, it was proof that, internationally, Stothard was fast becoming a force to be reckoned with. The final fixture for Stothard in 1934 was the British British Empire Games, which were held at the White City in early August 1934. Stothard had been selected to represent Scotland in the half-mile and in the mile relay. The half-mile qualifying rounds, decided on August 4, were very competitive and proved a stumbling block for Scotland’s other representative, Bobby Graham. Stothard, on the other hand, was impressive in the third heat, which he won comfortably from Canada’s Jerry Sampson in 1:56.0; Cliff Whitehead, 1933 A.A.A. champion, was third and failed to progress. The final was decided two days later, the six finalists being Phil Edwards (GUY), Jack Cooper (ENG), Jack Powell (ENG), Willie Botha (RSA), Hamish Stothard (SCO) and Jerry Sampson (CAN). It was the spectacular of the meeting. The coloured runner Phil Edwards, of British Guyana, a bronze medallist for Canada at the Los Angeles Olympics, stormed off in characteristic style, but for some unknown reason Cooper, who was fancied for his event, ran outside Edwards on the first lap and pushed him to a 53.2 first quarter-mile. At the bell the British Guyana representative was leading by a few yards from Cooper and Botha, followed by Stothard, Powell and Samspon, together at the back of the field in a shade under 55 sec. Edwards kept piling on the pace down the back straight, his long strides carrying him clear of Cooper, who ultimately cracked and trailed home last. Only Botha, Powell and Stothard were able to take up the chase, but all their efforts to overhaul the popular Guyanan proved to no avail. Edwards held his form to win his first major title by 8 yards in 1:54.2. Behind Edwards, there was an almighty three-way battle for the minor places, Botha (1:55.5) gaining the silver and Stothard (1:55.6) wresting bronze from the unlucky Powell in a near-blanket finish. The following day Stothard ran the third leg for Scotland in the 4 x 440 yards relay. Unfortunately, the blue shirts were out of sorts on this day. Though they finished more than the length of the straight behind the English and Canadian teams, they were nevertheless assured a medal as only three countries were able to field a team. To view the British Pathe film featuring the dramatic Empire Games half-mile of 1934 click on this link: https://www.youtube.com/watch?v=w8nd9tqaXR8. Stothard, as a mark of the esteem in which he was held by his fellow students at Cambridge, was elected President of Cambridge University Athletic Club for the 1935 season, having served as the C.U.A.C. secretary in 1934. With a view to increasing his stamina, Stothard now stepped up the volume and began mixing with his half miles in 1935. Despite having done no track work. Stothard opened his season by running a personal best of 51.5 in the quarter-mile at Fenner’s on February 8. The following week, in the annual Inter-college Competition, the Cambridge University President turned out for his college in no fewer than three individual events. In addition to winning the half-mile, he tied with M.F. Dutton in the 3 miles in 16:27.2 and placed third in the long jump with a leap of just a shade under six metres. Sadly, his Herculean efforts were not enough to propel Caius to victory. At the Cambridge University sports on March 7, 1935 he focused on the mile, which he won by 50 yards from Peter Ward in 4:18.8 – a time which catapulted him into the British miling elite. His improved stamina also stood him in good stead at Varsity Match at the White City on March 23, when he scored one of the – if not the – quickest Varsity half/mile doubles on record. The half-mile saw him tie for first with fellow Cantabrian Michael Sullivan in 1:55.4, but the mile was much tougher and it was only by the narowest of margins that he outdipped W.T. Squires (Oxford) in 4:23.2. Then, on May 18, Stothard won the U.A.U. half-mile title for a second time at the White City, beating Michael Sullivan by 5 yards in a championship record of 1:56.6. This was the weekend before the annual Kinnaird Trophy meeting featuring the Polytechnic Marathon at the White City. The prestigious competition, which was instituted in 1909, was an inter-club contest open to clubs affiliated to the A.A.A. In many ways, it was a precursor to the modern-day B.A.L. Clubs were allowed to entered two athletes per event and the club scoring the highest aggregate points was adjudged to have won the trophy. Stothard was competing alongside Jack Lovelock for Achilles AC, the exclusive club open to O.U.A.C and C.U.A.C. members who had competed in the annual Varsity Match. 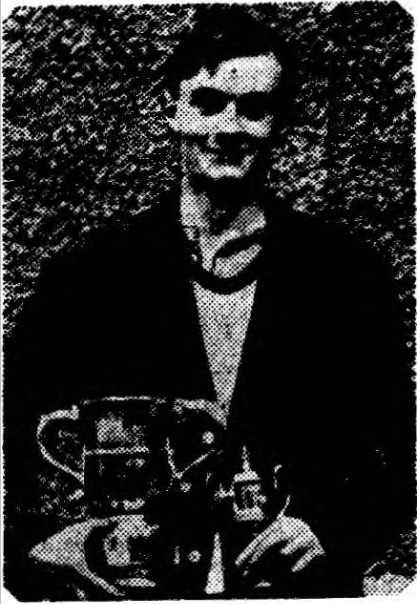 Achilles had had a virtual strangehold on the Kinnaird Trophy, having won it 11 times since its formation in 1920, but had lost it to Polytechnic Harriers in 1934. The Cambridge president was a firm favourite for the half-mile, and lived up to all expectations by seeing off Tommy Scrimshaw in the last furlong in front of 6,000 spectators. His time of 1:57.2 was six-tenths outside the best for the meeting. Relatively speaking, it was better than anything done before, having regard to the windy conditions. It would have been the highlight of the meeting but for Lovelock’s stunning front-running performance in the mile, which he won by 50 yards from Aubrey Reeve in 4:13.8. Achilles, thanks mainly to their middle-distance runners, were successful in regaining the coveted trophy. A 4:30.2 mile victory at the British Games on June 10 saw Stothard in blistering form, which he would capitalise upon five days later in match between the Varsity and the A.A.A. at Fenner’s. Defeating Aubrey Reeve by 18 yards he won the mile in a ground record of 4:15.8, which took him to within eight-tenths of Tom Riddell’s Scottish record. Academically, except for taking some examinations, Stothard was now finished at Cambridge. Having enrolled in the Officer Training Corps whilst an undergraduate, he was hoping to make a career as a C.O. in the Royal Air Force. Stothard, on the strength of this performance, was now a firm favourite for the A.A.A. half-mile title – a title which no Scot had ever won since the inception of the championship in 1880. In the meantime however he had a strength-sapping schedule of races lined up. The weekend after the S.A.A.A. championships he was back at Hampden representing Great Britain for the first time in an international match against Finland. Fired up to perform before a home crowd, he won the half mile by 5 yards from Jack Powell in 1:57.4 and anchored the 4 x 880 yard relay to victory in 7:52.0. Then it was off to the Belgian city of Antwerp where he turned out the following day (!) in a match between Achilles AC and Belgian clubs. Despite having travelled overnight from Glasgow, he showed little sign of tiredness and duly scored maximum points in the 800 metres with 1:57.4. Then it was back to Scotland, where three days later he turned out for Atalanta in a match against the Scottish Eastern District at Craiglockhart, winning the quarter-mile in 52.4 and the half-mile in 2:00.6. In the A.A.A. championships at the White City on Friday July 12, Stothard, representing Cambridge U.A.C, won the first of four heats in 1:56.1. The “dark horse” was the meteoric 18-year-old Ralph Scott, the English public schools champion, who was the fastest of the qualifiers. Overall, the standard was the highest since the legendary final of 1926, when the German Otto Peltzer defeated Douglas Lowe in a world record time of 1:51.6. The final was a great contest and a fast one, too, thanks mainly to Scott. The Leicester public school boy set a cracking pace and led at the bell in 56.2, with Stothard holding on grimly in second. Down the back stretch the pair piled on the pace, then with a furlong from to go Stothard moved up on to the youngster’s shoulder and struck for home, gaining a couple of yards. Down the home straight, Stothard called on every ounce of energy and, holding off a late run from Jack Powell, raced to victory by a couple of yards in 1:53.3 – a Scottish record and the third best championship time in the long series. Powell was officially given 1:53.8 and Scott 1:54.0. The finishing photo would however suggest the times and placings of the minor medallists were incorrect, as Stothard won by no more than 2 yards and Scott, no. 21, clearly crossed the finishing line ahead of Powell (no. 14). Stothard’s major goal for 1935 was the International University Games in Hungary in August. Until then, however, he had several races lined up. The first was the annual International Varsity Match between Oxford and Cambridge and Harvard and Yale at the White City on July 20, and, opting to run the mile, he made short shrift of the opposition, winning by 15 yards from Harvard’s John Scheu in 4:26.8. The following weekend he was back at the White City where he donned his British vest again for a match against France, winning the half-mile by 7 yards from Jack Powell in 1:57.4. On the journey out to Hungary the British team stopped over in Munich and contested a match against Germany at the Dante Stadium on August 11. 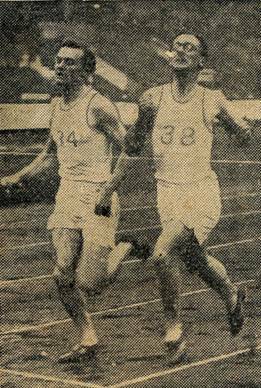 The Germans won the match 75-61 before 15,000 partisan spectators, but Stothard maintained his perfect record for the season in the half-mile with a well-timed run which carried him to victory by a metre over Wolfgang Dessecker in the 800 metres in 1:54.4. The German was the reigning International University Game champion at this distance, so defeating him might have been considered a good omen. The 1935 International University Games were held in the Hungarian capital of Budapest from 10-18 August with a total of 774 athletes from 62 nations competing in a programme featuring ten events.